The challenger has become the champion as Ippo Makunouchi now wears the featherweight championship belt of Japan. Some time has passed since Ippo's victory, and he has found his friends and coach as supportive as ever; his crush, Kumi Mashiba, seems to enjoy spending time with him as well. Things are looking bright for the new champion, but just as he once set his sights on becoming the best, his first challenger poses an intimidating threat. Kazuki Sanada works as a doctor at the same hospital as Kumi and fights strategically. Known for integrating his knowledge of the human body into his fights, Sanada is a fearsome contender—however, more unnerving than his physical ability, he has garnered the support of the nurses. Despite being the champion, Ippo feels the pressure as he must face the daunting challenge, retain his belt, and win over the girl he loves. Champion Road, the amazing conclusion to a very long and amazing anime. I'm not a fan of sports anime/manga in general, but when I see something that catches my eye, I'll watch it whatever it is. Originally I was searching for Ashita no Joe, but then Hajime no Ippo caught my eye. Story: Essentially Ippo is fighting a medical student. Everything else is.....secondary. The romance bit was tacked on, but it kind of felt alright if not a little bit out of place. But in the 90 minute movie about an hour of that is fighting. So for me, the story doesn't really matter, what mattered was the fighting. And the fighting is amazing. Since Ippo is fighting a medical student the guy knows exactly where to hit to hurt someone.....and he does. The way the fight unfolds kept me completely interested in it for the entire hour-long duration of the film. This isn't Naruto where a fight can get boring and you sort of skip through scenes, the fighting in this is intense and got my adrenaline pumping at certain moments. However there were a couple times that just bugged me a little bit, such as when Ippo just gets beaten SO hard and he's ABOUT to fall down...but doesn't. This happens two or three times in really quick succession and it's the only bad thing about the fighting. Art: A HUGE improvement from the beginning of the anime series. The characters look a lot smoother and look more human, less squished. However, the art is still....ugly. The faces are very square, bruises are represented by lots of lines....just small little things that add up to art that doesn't really impress. The art is shown in it's worst light when it comes to females. Ippo's love interest is very....ugly. Well...not ugly so much as plain, predictable, and very boring and awkward to look at. However, I'm completely missing the point. The anime is about fighting...nothing else should really matter. The fighting is AMAZING. I don't think they reused any of their frames. They change angles constantly and watching the fighting was simply amazing. Sound: It sounded like a fight, like a hard gritty fight....and that's all that should matter. Ever sound effect was greatly placed, everything sounded perfect. Some of the music they used was a little corny, but what can you expect from a sports anime? Character: I don't really know what to put for character. I want to say that the character's were great, but I honestly don't know if they were. I really rooted for Ippo, he's just a really nice guy who wants to know what it is to be strong. He's really easy to emphasize with, but it also seems....too easy to emphasize with him. I mean, he's the champion of Japan......and yet he's still shy and humble and the same sort of kid that he was at the start of the anime series. I mean there's no chance of him going through all of that and still being the same kind of person that he was however many years ago. The other characters were either the love interest (who isn't really even worth mentioning, she blushes when he talks to her and secretly loves him...predictable) the coach (who does coachy things like telling him to keep fighting) or his boxing buddies (who don't really do too much). Enjoyment: Honestly, I loved it. The parts were Ippo was not fighting kind of bored me a little bit and I didn't pay too much attention during them. But the anime is about boxing.....not about having a great storyline. And the fighting is so amazing. I've seen a lot of action scenes in anime before, but this one was so completely different from anything else I've seen. I've never rooted for anyone more, I've never really cared more about anyone winning more than Ippo. I was so drawn into this anime, and I never expected that I would. I honestly think this anime is good for everyone. Even if you don't really enjoy action or sports themed anime this is worth checking out. If you enjoy it that's great, and if you don't enjoy it, at least you've seen something good. This has been the first sports anime I've watched, the others haven't interested me too much, but Ippo is definitely worth watching. I thought they fit a considerable amount into this TV special. However, some of my main gripes in relation to this series will of course be in relation to what was omitted from the manga. 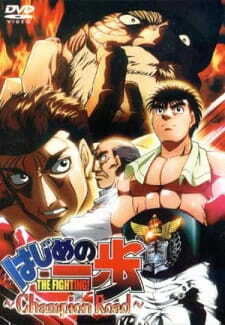 For example, I was upset that they took out Hayami vs Kobashi for Sanada&rsquo;s vacated jr. featherweight title, it was a fight people enjoyed and gives further character development for the winner for that fight at some capacity, and it also sets up how Ippo first meets Sanada and Dankichi, which made the build up more dramatic, while in this anime, their initial encounter is just at the weigh-in. Other than that, it serves the overall purpose of being a TV special and everything is paced just fine, but being based on a very long manga, your natural reaction is that you&rsquo;re going to want more. The character designs are pretty much the same except the resolution is of course a much higher quality than the TV series and it adds more depth to it. The main fight of course still brilliantly put together as usual, but the ending felt repetitive and makes you wonder if this could be the direction Hajime no Ippo could be going. The execution of the hien is of course awkward, but I&rsquo;m sure there are boxers in real life who have the capability of pulling off some a technique with the angles and speed, just like how Muhammad Ali in his Cassius Clay days could pull off the shot gun. But I liked how Sanada&rsquo;s fighting style sort of represented an anti-Ippo fighting style at a technical and brawling level. Other than that, I wanted to see how Kobashi vs Hayami would have turned out in anime form. Not really much to add here from the TV series review except for Yamdera Koichi&rsquo;s voice being lent as Sanada. If you don&rsquo;t know him, he was the voice of Ryouga from Ranma &frac12;, Kaji from Evangelion, Gyuunei from Char&rsquo;s Counterattack, Togusa from Ghost in the Shell, and last and not least, Spike from Cowboy Bebop. I thought he was a very credible addition to this series and I like how he portrayed his outside personality of being an intellectual doctor very well and also portraying that aspect of his personality inside the ring. After this appearance in the manga, he has two more which played some useful parts to certain aspects. It&rsquo;s a pity the anime so far has been halted which would prevent any future use of his talents. Also, the music in the series is still present and still appropriately used. Like I said, the ending to the anime is only the beginning in the manga. As much as I don&rsquo;t like him, former UFC Welterweight champion Matt Hughes once said that a champion is not defined by winning the belt, but how far he can go with it, but that saying applies very well to this product. Ippo finally only achieved one step in his career and his overall goal throughout a huge portion of the manga is to seek his rematch with Miyata. This movie was great!!!! It was almost as great as when he won the title, in this movie you see the reason why he loves boxing and what it means to be strong, i personally liked this a lot, he defends his title and and also fights for his love, so please watch and comment on it.Now i wanna see the fight of Takamura for the world title!!! so please can we have this as a movie or a OVA!!! What makes Hajime No Ippo great are its characters. This includes Ippo's opponents. Unfortunately for this special I felt nothing for Ippo's opponent. The opponent's rationale didn't make sense. Why are you fighting? What are you trying to prove? The latter is never really fleshed out but passingly mentioned. I can't rate this special any higher than a 6 because I feel a lot of episodes from season 1 were better than this. As mentioned in the description the special is about Ippo defending his title and his relationship with Kumi. The later of which was one of the flaws in the first season so I'm glad that they tried addressing that. Their relationship always seems to take 2 steps forward and 1 step back. The problem is I don't think they fleshed out the relationship well in this special. Instead of growth it felt more like a bump on the path and felt unnecessary. I hope in future seasons the show takes a page from Rocky, there needs to be actual growth in both of them for this to be anything of substance. I would recommend this special for those who are a fan of the mechanics of the show, specifically how they incorporate real life boxing and the effects on the body. I always wanted an opponent who is knowledgeable on the body and that's what this special was about. This special felt very clinical and devoid of the heart that makes Hajime no Ippo great. I wouldn't recommend it for people who didn't care for season 1; but for fans it provided us with a bit of closure because the ending of season 1 felt a little cut short.